Several new University of California forage oat varieties have been developed by Dr. Cal Qualset, Small Grains program, UC Davis recently. These are generally grown together in hay mixtures (e.g. a mix of oats, barley, and wheat), or as a sole-crop. It's important for farmers to take advantage of breeder's efforts to improve crop varieties, since it takes many years to develop improvements. 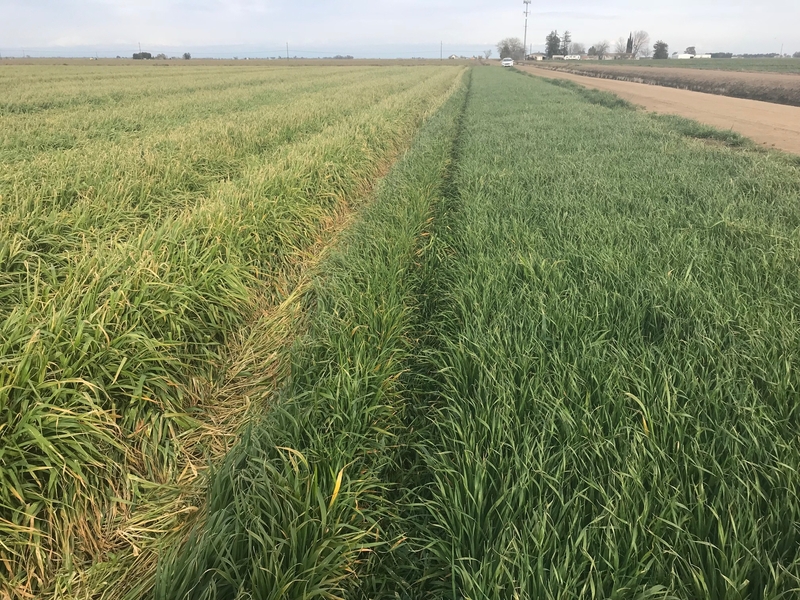 These new oat varieties show better disease resistance and grain and forage yields than the standard California Red and Montezuma varieties. New lines include UC 113, UC 128, and UC 148 (available from Baglietto Seeds) and UC 125 and UC 132 (available from Barkley Seed/Lockwood Seed). These varieties also show some frost avoidance, as they head out later than Montezuma, helping to escape frost injury. In general, more mature spring cereals are at greater risk of being affected by frost, because the growing point is further from the ground, and thus less buffered from a frost, than younger plants. Photo: Frost injury to Montezuma (left, Yolo Co.) when min temperatures were below 32F (28F-31F) for 5 days late February (CIMIS, Davis, CA 2018). Newer oat hay varieties (right) head out later, often avoiding frost injury. Figure 1. Improved UC lines (right) avoid early frost damage observed on Montezuma (left) since they head out later. Following is a description of these UC varieties, compared with Montezuma. More information is available at http://smallgrains.ucanr.edu/files/282307.pdf. UC 113: Heading later, 4-5 inches shorter. Excellent straw strength, thicker. Good resistance to barley yellow dwarf virus and stem rust. Higher grain and hay forage yields, higher crude protein, and lower acid and neutral detergent fiber percentage. UC 125: Heading later, 4-5 inches shorter. Excellent straw strength, thicker. Good resistance to barley yellow dwarf virus and stem rust. Grain and hay yields higher, higher crude protein, and comparable acid and neutral detergent fiber percentage. Recommended for planting in areas north of the Sacramento Delta, up to Willows, CA. UC 128: Heading later, 8-10 inches taller. Excellent straw strength, thicker. Very good resistance to barley yellow dwarf virus and crown and stem rust. Higher grain and hay yields, higher crude protein, comparable acid detergent fiber, but higher neutral detergent fiber percentage. UC 132: Heading later, 5-8 inches shorter. Excellent straw strength, thicker. Good resistance to barley yellow dwarf virus and crown rust. Higher grain and hay yields, higher crude protein, and comparable acid and neutral detergent fiber percentage. Recommended for planting in areas south of the Sacramento Delta, down through the low desert. UC 148: Heading later, 3-inches taller. Good straw strength, thicker. Good resistance to barley yellow dwarf virus and crown rust. Higher grain and hay yields, higher crude protein and comparable acid detergent but higher neutral fiber percentage.